Single origin vanilla beans are infused in carefully paired spirits to make extraordinary extracts. 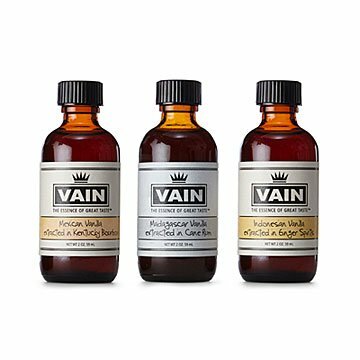 The rich aroma and sweet, creamy flavor of vanilla is always pretty swoony, so when you try this extraordinary trio of vanillas, make sure you're sitting down. Made of the best single origin vanilla beans available, they're hand-split and cold-infused in spirits chosen to perfectly pair with each variety's flavor profile. Experiment with them in baked treats, and try them in cocktails, vinaigrettes, spiced nut mix, and, of course, whipped cream. And try a drop or two in your coffee to begin the day with a subtle, secret swoon. The classic smooth flavor and subtly smoky tones of Mexican beans are paired with Kentucky straight bourbon, with complex caramel and vanilla notes. The rich, creamy, superior flavor of Madagascar beans becomes sweeter and even richer after some quality time in cane rum. Vodka infused with fresh ginger blends sensationally with woody, smoky, Indonesian beans. In 2013, Kate Banks' mother gave her a big bunch of vanilla beans as a gift. Even an excellent baker like her couldn't figure out how to use that many, so she and her neighbor—and fellow chef—Charlie Hammond decided to experiment with making extracts. Traditionally, vanilla extract is made with vodka, because of its neutral flavor. They figured they'd try everything else. They shared the results with friends and family, and when people tasted how delicious certain combos were, Kate and Charlie decided to invest in equipment and supplies to make them on a larger scale. They hope customers will use them as flavors—in coffee, ice cream, even hot breakfast cereal—and of course, to transform their favorite baked specialties. Store in a cool, dry location away from light. I know two very creative cooks and this will make an excellent gift to both of them. This was such a great product for my boyfriend who loves to bake. He loved how each flavor had their own unique taste and you could actually taste the flavors after baking! He went through them all already and is already asking when I will be buying more! The vanillas are so creative and came in the coolest box! There are also little recipes inside the box behind the vanillas which is very creative. Great product!